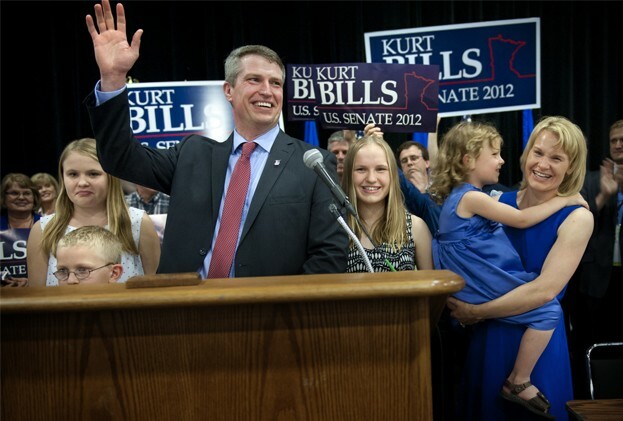 Kurt Bills wows the crowd	(www.startribune.com). What are a lawyer, a community organizer, and a comedian? The line is cute, “quippy” and closely follows the Republican playbook established years ago by Karl Rove. In football, it is called a misdirection play. In politics, it says that when your qualifications are nowhere near those of your opponent, go personal and cute while avoiding actual résumé or accomplishment comparisons. That’s from a letter in the Strib. He’s the new clown prince of the Republican party, all right. But who’s the clown, really? My vote is for the guy who authored a bill to make gold and silver coins legal tender and to explore Minnesota beginning to print its own money. Can’t you see the headline: Bills Promotes Minnesota Bills! And Bills is the guy — along with sweating ideologue fellow travelers Keith Downey and Doug Wardlow — who authored a bill, that in the words of website sidekick Aaron, drew the most stinging veto rebuke of Governor Dayton’s tenure. You really ought to follow the link to the bill and read the preamble. And all this time, you thought that Mike Parry was crazy. The U.S. does have a long term deficit problem that would easily be fixed by spending a little less on the military and introducing more progressivity into our tax system. It really isn’t stretching a point to say that Bills — and Downey and Wardlow, too — want to return to the stirring days of the Articles of Confederation, that miserable and disastrous first draft at making a country right after the Revolution. It only took the country’s leaders at the time about a dozen years to figure out what a failure that was; regrettably the current crop, represented by candidate Bills, isn’t nearly as bright.